27 innovative firms from the U.S., Europe and Asia demonstrate technologies that make private capital market transactions, faster, easier, lower cost and more transparent. 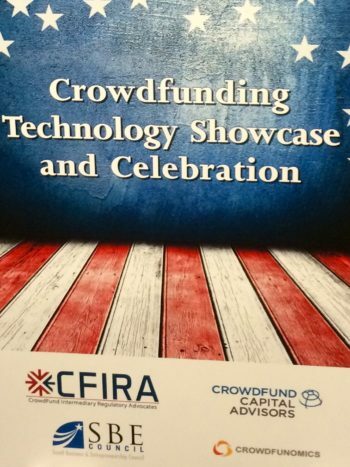 Washington D.C. – At a Capitol Hill event on May 16, an overflow audience of government leaders, global development organizations, NGOs including small business associations, and technology investors celebrated the launch of securities-based crowdfunding in the United States, for all Americans. On this landmark day, attendees viewed demonstrations of the Web, mobile, machine learning and social networking technologies that provide new and transparent ways for small businesses and startups to raise the capital they need grow and hire while providing prudent investor protections. The event was hosted by Crowdfund Capital Advisors (CCA), the Small Business & Entrepreneurship Council (SBE Council) and Crowdfund Intermediary Regulatory Advocates (CFIRA). The goal of the event was to bring together stakeholders that are working to create opportunities for small and medium-sized businesses (SMEs) to start and grow. “The event demonstrated how smart entrepreneurs can leverage technology to assist them in the process of raising capital from the crowd while at the same time providing investors with meaningful disclosures about the risks of the opportunities and regulators with transparency and oversight of the industry,” said Sherwood Neiss, Principal at Crowdfund Capital Advisors. CCA screened nearly 100 companies for the event and selected 27 that demonstrate how the industry has already created innovative technologies in these 5 sectors. “In 2010, we created the Startup Exemption Framework and began our work to legalize securities-based crowdfunding in the United States. At that time, we told government and regulatory leaders that technology solutions would be created to make this a viable, transparent and efficient market. This event is to demonstrate that the private sector has turned our predictions into reality. We believe technologies like these, will also reshape the global private capital markets,” said Best. According to April, 2016 research from Cambridge University’s Center for Alternative Finance, securities-based crowdfunding for accredited investors is off to a strong start in the US. In 2015, $590M was raised via securities based crowdfunding, which was more than double the amount raised in 2014. Assuming a similar growth rate and the addition of unaccredited investors to this market, it appears likely that this market will top $1billion in 2016. For startups, small and medium sized businesses that are located outside of Silicon Valley, New York City and Boston, this is a game changer for innovation, job creation and economic growth across the United States. Crowdfund Capital Advisors is a global crowdfunding consulting and advisory firm founded by Jason Best and Sherwood Neiss, the leaders of the debt and equity crowdfunding movement. Best and Neiss created the proposed regulatory framework that became the crowdfunding language in the USA JOBS Act. CCA provides comprehensive advisory and investment solutions for both the public and private sector to 1) create balanced crowdfunding legislation/regulation with governments and regulators 2) advise innovators as they build the global FinTech infrastructure required for the new private capital markets and 3) invest in companies building that global FinTech infrastructure. CCA has worked in 37 countries with professional investors, crowdfunding platforms and ecosystem services, financial institutions, governments and regulators. CCA is the author of the World Bank Report, Crowdfunding’s Potential for the Developing World, the top selling Amazon book on Investment based crowdfunding and creators of the online education series Crowdfunomics and Success with Crowdfunding. For more information, please visit: http://www.crowdfundcapitaladvisors.com. The Small Business & Entrepreneurship Council (SBE Council) is a nonprofit, nonpartisan advocacy, education and research organization dedicated to protecting small business and promoting entrepreneurship. SBE Council works to strengthen the entrepreneurial ecosystem by focusing on policies, education and training, and access to capital and markets that enable business creation and small business growth. For nearly twenty-four years, SBE Council has successfully advanced policies and a broad range of initiatives for small businesses and entrepreneurs both in the U.S. and across the world. For more information, visit: https://sbecouncil.org. Crowdfund Intermediary Regulatory Advocates (CFIRA) was established following the signing of the Jumpstart Our Business Startups (JOBS) Act and formed by the crowdfunding industry’s leading platforms, experts and supporters. The group works with the Securities & Exchange Commission (SEC), the Financial Industry Regulatory Authority (FINRA), and other affected governmental and quasi-governmental entities to help establish industry standards and best practices. For more information, visit: http://www.CFIRA.org.